This post contains spoilers for GC3DAPD. If that kind of thing bothers you, stop reading right... now. I got a new phone last month. Normally this would not be in any way significant, except that this phone (despite being a Nokia brick) has GPS. Like actual, honest to god, beaming from satellites in space GPS. I'm actually a little embarrassed that it took me so long to figure that out. I just thought they'd made stunning advances in triangulation in Google maps until I noticed the GPS data section in the menu. Maybe I should've read the manual. I bet it's in the manual. Anyway. Yes. GPS. This could obviously only mean one thing: It was time to start Geocaching. 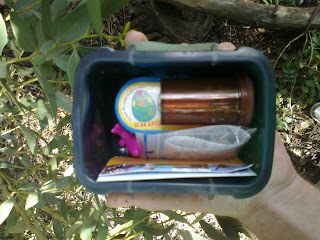 Geocaching, if you weren't previously aware, is a worldwide GPS-based treasure hunt. You hide stuff, and log its coordinates online, and then you go on treasure hunts to find other people's 'caches'. It gets more complex than that, some have puzzles and things, but that's the essence of the game. So last night I signed up on the largest repository of said coordinates, and asked it where my nearest cache was. The first thing that blew my mind was the scale of this thing. The cache map defaults to Seattle (I think) and there was literally a cache on every block. Even in tiny, boring Perth, there's easily a hundred or so within biking distance of my house. 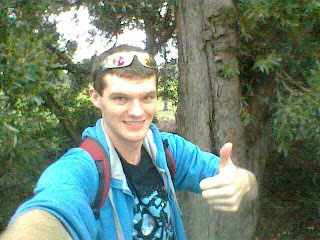 The site recommended me a 'beginner cache', that wasn't too hard to find, and was reasonably close to my house. And then my mind was blown for a second time. I had been cycling right past a tiny hidden stash of treasures on my way to uni every day since the start of the year. So I scribbled down the coordinates and stopped there on my way home. It was actually tougher than I thought. I spent about 15 minutes wandering in circles, looking in trees, and waving my phone in the air to get a better signal. I thought I must've made a mistake, or that someone had moved the cache without logging it online, or that this whole thing was somehow an elaborate hoax. And then, just as I was about to give up, I saw it. It was very cleverly hidden. It's far enough into off the path that there's no chance that anyone would just stumble upon it, but once you know what you're looking for it's as plain as... something very plain. Water crackers or something. The 'treasure' was mostly keyrings and stuff, and I hadn't brought anything with me to put in by way of replacement (which I gather is one of the rules) so I just signed the little log sheet and hid it back where I found it. 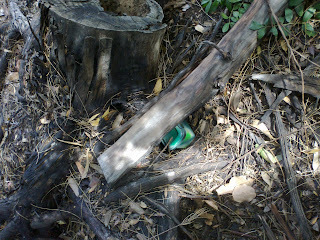 So that's the story of how I found my first geocache, I guess. It was pretty rad. The idea that there's this game, this elaborate system which most of us aren't even aware of, that just sits on top of everyday reality like another layer, secretly ticking over, filled with secrets and treasure and adventure... I think that's probably one of the coolest things ever. Daww, it's my first cache.